The massive Giant Clam, Tridacna Gigas, is the largest mollusc in the world! The Tridacna gigas clam is commonly called the Giant Clam or Gigas Clam. It is the largest clam of its genus, as well as the largest bivalve of all. This massive clam has been recorded at a maximum length of 4.5 feet (137 cm) and can weigh up to 734 lbs (Knop 1996) once full grown. This species is the True Giant Clam! This impressive clam species has long been popular as both a food source and a novelty. In the wild, its numbers have been greatly reduced because of over collection and hunting. However, the Giant Clam, along with its cousin the Derasa Clam Tridacna derasa, are the first aquacultured species of Tridacna clams. Today both of these giant clams are cultivated in captivity and supplied as a food source, but they are also readily available to the aquarist. These large, heavy bodied clams are very colorful and attractive in the aquarium. Yet in the wild, some Giant Clams, are so over-grown with sponges, corals, and algae, that their shape is unrecognizable! In past times, myths and fears about the idea of this unknown clam led it to be called the "killer clam"' and the "man-eating clam." Of course today we know these myths are absurd. A Giant Clam is totally non-aggressive. In fact, it is so heavy that it has to stay in one place and it can not even completely close its shell when it gets large. Giant Clams have thick smooth shells with 4 to 5 pronounced ribs. A juvenile Gigas may have some sparse scutes, but once they reach adulthood, their shells are without scutes. The mantle is usually golden brown, yellow or green, decorated with many iridescent blue or green spots, especially around the edges. Larger Gigas Clams may have so many of these spots that the whole mantle appears blue or purple. The Gigas Clam has proven to be one of the hardiest giant clams for the aquarium. They are relatively easy to care for and can grow very rapidly when provided with adequate light and calcium levels. However they will need ample room in the aquarium, as true to their name, they can can become very large. Growing over 4 inches per year and commonly reach a length of over 2 feet (60 cm) within 10 years (Crawford and Nash, 1986), they will eventually need at least a 300 gallon tank. The Giant Clam Tridacna gigas was described by Linnaeus in 1758, and it is also commonly known as the Gigas Clam. The Tridacna genus are called Giant Clams as well, however, the Gigas Clam is the only one in the group who has truly earned that name. It is the largest bivalve (mollusc) known, reaching a maximum length of 54" (137 cm) and can weigh up to 734 lbs (Knop 1996) once full grown. The Derasa Clam Tridacna derasa comes in second, but they only grow about half as large. Giant Clams are found in the eastern Indian Ocean and the west Pacific Ocean, from Thailand and western Australia and eastward to Micronesia. The can also be found from the southern islands of Japan to the Great Barrier Reef and New Caledonia. There are doubts about T. gigas being found in Fiji according to The Reef Aquarium Volume One, as years of observations throughout Fiji have never turned up any living T. gigas or fossil shells. The Gigas Clam has,, however, been "re-introduced" there. These massive clams are listed on the IUCN Red List as Vulnerable (VU) as they are a food source for the native people of these waters, and in some areas they are almost completely gone. However, along with its cousin, the Derasa Clam Tridacna gigas, it was one of the of the first aquacultured species of Tridacna clams. Popular food item, these two giant clams have been hunted extensively throughout their natural habitats. But Today both of these clams are cultivated in captivity and there are plenty of aqua-cultured Gigas Clams available, so there is little pressure put on collecting wild specimens. The Gigas Clams are usually found on sandy bottoms, coral rubble, amongst live corals and on limestone bottoms. They prefer reef flats, shallow lagoons and even intertidal spots where they can be exposed to the air at low tide. They can be exposed to air for a few hours at a time with no harm done. Although they commonly occur in shallow waters, they can also be found as deep as 65 1/2 feet (20 meters). Unlike Crocea Clams Tridacna crocea, Gigas Clams are found in the substrate or on top of corals as juveniles, not burrowed rock. As adults they may embed themselves into the substrate, but their sheer mass holds them in place. In the wild, they are known to provide a protected living area within their cavity for a single pair of Xanthasia murigera, a small Pea Crab. Predators are small pyramidellid snails that bore into their tissue and feed on their bodily fluids. While this is less of a problem in the wild, it is more of an issue in enclosed systems. Unlike Crocea Clams, Gigas Clams are found in the substrate or on top of corals as juveniles, not burrowed rock. The Gigas Clam is the largest bivalve known, and can weigh up to 734 lbs (Knop 1996) once full grown and can live over 100 years. IUCN Red List: VU - Vulnerable - They had been hunted for food, but as they are now aquacultured, there is little pressure put on collecting wild specimens. Gigas Clams are the largest of the giant clams. They have a maximum length of 4.5 feet, at 54" (137 cm), although are most common just under 3 feet, at 31.9" (80 cm). They can grow at a rate 4" plus per year and become sexually mature on average around 12" (9 to 14"), which is around the time they are 2 years old. They are all born males then turn female as needed. They have been kept in captivity for decades. While the Tridacna genus can live over 200 years in the wild, this species is said to live over 100 years. Giant clams have a soft, laterally compressed body that is enclosed in an elongated shell. The grayish-white shell consists of two hinged parts. The hinge is usually about than half the shell's length on juveniles, but may grow to as much as 2/3's of the shell length on adults. The hinge has an opening called the "byssal opening," where a muscular foot attaches to a hard surface. They have no head, but their soft body consists of a mantle forming an outer wall that encloses a visceral mass containing the body's organs. The mantle protrudes in the form of flaps that are usually quite colorful. The siphon, also called the intake siphon, is a fleshy tube-like structure that is part of the mantle. The intake siphon is used to direct water flow into the mantle cavity and across the gills. The mantle of the Giant Clam is usually golden brown, yellow or green. The mantle will have many iridescent blue or green spots on its surface, especially around the edges. These spots, known as eyes, consist of dark spots bordered by blue-green iridophores rings (light reflecting cells). Larger T. gigas may have so many of these spots that the whole mantle appears blue or purple. These clams also usually have numerous pale or clear spots, mostly located near the center of the mantle. According to The Reef Aquarium Volume One, these clear spots, referred to as "windows", may serve to focus or allow more light through. Adults will have large, thick, heavy shells, without scutes. Juveniles may have sparse scutes. When large specimens are viewed from above, the tops of the shells will have 4 to 5 large inward facing triangular projections. These triangular inward projections only become apparent as it becomes larger, not when small. Juveniles have a hinge that is 1/2 the length of the shell and is fan-shaped. •Adults can have a hinge that is up to 2/3rds the length of the shell. Gigas Clams have a lumpy, meaty flesh with "dots" throughout. Juveniles may also have tubular projections near the umbo. The inhalant siphon has no tentacles. As the clam grows, it will lose its byssus gland, relying on size and weight to hold it in place. The ribs of the Giant Clam are more pronounced. A juvenile Giant Clam may have sparse scutes, but an adult does not. Gigas clams of moderate size cannot close tightly like a Derasa Clam. Gigas juveniles develops finger-like projections on the valves, while the Derasa Clam will not. Use the mantle coloring of each species. There have been possible hybrid crosses of T. gigas and T. derasa offered for sale. Characteristics and coloring of these hybrids has been divided between what is the norm for T. gigas and T. derasa. For example, a hybrid mentioned in The Reef Aquarium Volume One had tentacles on the inhalant siphon like the T. derasa. Also according to The Reef Aquarium Volume One, some of these hybrids have teardrop shaped clear windows along the edges of the mantle. Size of organism - inches: 53.9 inches (137.01 cm) - Though they commonly reach about 31 1/2" (80 cm), the record size is 54" (137 cm). They are sexually mature at 12" (30 cm). Lifespan: 100 years - May live for decades in captivity. While the Tridacna genus can live over 200 years in the wild, this species is said to live over 100 years. The Giant Clam is attractive, occasionally available for the aquarium, and is considered the most hardy of the Tridacna clams. It is, however, the fastest growing of the Tridacna clams and can easily outgrow the home aquarium. Adequate room must be provided for their 4" of growth per year. If a healthy clam is obtained, with proper lighting and and good water quality, these clams are quite hardy and relatively easy to keep. Given a very large tank with strong lighting and careful attention, Giant Clams require little else in the way of care, making them well suited for intermediate aquarists. They don't like huge fluctuations in their water parameters and they are not tolerant of sudden increases in light intensity. They are not as sensitive as other clams, however, they still need a stable, low to moderate, water flow and lighting that is in the 6K to 10K range. They also need an aquarium that can hold their eventual 500 lbs. Clams under 4" are not as hardy and do not ship well. When they are first obtained, inspect the clam's shell for predators that can be removed. It is important to make sure they are not being irritated or fed upon by other organisms. If the clam is predominately brown, it should be placed lower in the tank away from strong lighting. The brown coloration is the clam's zooxanthellae showing and is probably due to the clam losing its protective coloration during transport. They will adjust to their new surroundings in time, and will become a little more hardy. But to keep them healthy, avoid wide fluctuations in light, water flow, reef water parameters (calcium, magnesium, etc. ), and salinity. They need a low to moderate water flow, and are not tolerant of sudden increases in light intensity. Aquarist Experience Level: Intermediate - A very large tank is needed, and stable water parameters. Most clams fulfill their nutritional requirements by filter feeding and absorbing dissolved organic compounds from the water. The Tridacna clams have gone even further than this, using zooxanthellae to manufacture food for themselves. They receive the majority of their nutrition from their zooxanthellae, yet research has shown that all Giant Clams that are under 4" do not have enough mantle tissue to provide enough space for zooxanthellae to keep the clam alive. Gigas Clams also eat more food, via filter feeding, than some of the other clams, such as the Crocea Clams. It is generally believed that mature giant clams do not require feeding in the aquarium. Whether additional feeding is required is still debated. Some hobbyists believe they should be fed, going on the assumption that they are filter feeders like other clams. Basic nutrients in the aquarium that giant clams need are calcium, strontium, iodine, and a minute amount of nitrate that is at least 2 ppm. They will not thrive at a level of 0 nitrates. These clams have large amounts of zooxanthellae that live in their tissues. With plenty of light this algae will make too much food for themselves and the extra carbon and glucose is given to the clam (similar to most reef corals). The actual zooxanthellae themselves can be eaten by amoeboid cells within the host clam if needed. Giant clams have the ability to absorb nutrients like ammonia, nitrate and phosphates from the water. Giant clams are filter-feeders, straining fine particulates like phytoplankton, zooplankton and detritus from surrounding waters with their specialized gills. Since Gigas Clams are very dependent on phytoplankton from various sources when younger, they need to be spot fed several times per week. If they are under 2" to 4" they may need daily feedings. Feed them micro-foods designed for filter feeders such as a yeast-based suspension that has been mechanically whisked, live phytoplankton or commercially prepared micro-foods like 'marine snow' or 'reef snow’. In the wild, once they are older, they basically make their own food on days when the light is not strong enough. Since this shouldn't be an issue in captivity with good lighting, they do not need to be fed phytoplankton foods unless they are in an aggressively skimmed tank. If they are in a tank with lots of fish, once they are 12" they really do not need to be fed directly.For more information about the feeding process of Gigas Clams see What Do Clams Eat. Diet Type: Omnivore - Nutrition is obtained through filter-feeding of phytoplankton, zooplankton and detritus along with lighting and the marine algae, zooxanthellae. Live foods (fishes, shrimps, worms): Some of Diet - Clams under 4" will need live phytoplankton to thrive. Liquid Foods: Some of Diet - Marine snow or other phytoplankton substitutes, especially if there are no fish. Lighting and the marine algae, zooxanthellae, make up the rest of the food. Meaty Food: Some of Diet - The rest comes from lighting and the marine algae, zooxanthellae. Feeding Frequency: Daily - Feed clams daily up to 2" in size, several times per week up to 4", and weekly up to 8." At 12" and larger, do not feed them if there are plenty of fish in the tank. Gigas Clams are quite hardy and relatively easy to keep if a healthy clam is obtained. Stable tank conditions are required to keep the Gigas Clam healthy. With proper lighting, good filtration, and careful attention it will thrive. Do typical water changes of 10% biweekly, 20% a month, or 5% weekly. It has been noted that 5% weekly water changes replenish many of the needed additives. If you have a healthy specimen, it will grow very rapidly in the aquarium when provided with adequate light and calcium levels. Place it where you want it to stay as a several 100 pound clam will be difficult to move. Keep a watch for predators as this clam can be easy prey with its large and wide byssus gland opening. Giant Clams do well under moderate to relatively high lighting intensities. Provide a low to moderate water flow. As with all the Tridacna clams, you really don't want your water parameters to fluctuate too much! Calcium: Calcium is the main building block for clams and should be present in the water at levels of at least 280 mg/L for growth to occur. Seachem's calcium additive works at 385. More rapid, natural growth is seen when calcium is in the range of 400-480 mg/L. Iodine:The addition of iodine to the aquarium will also enhance growth and color. Use caution, as iodine spikes have been known to kill them. Add iodine with top off water or dose daily, but not at one time in a big weekly dose. Nitrate: They require some nitrogen for proper growth. They will not thrive at a level of 0 nitrates. Nitrate can be added if levels are extremely low, but be careful as nitrates should never exceed 2 mg/L. Provide a minute amount of nitrate that is at least 2 ppm. It is important to make sure they are not being irritated, not being fed upon by other organisms, and good water quality must be maintained. With careful attention paid to water parameters and proper lighting, Giant Clams require require little else in the way of care. They are the fastest growing of the Tridacna Clams, however, and they get very large, so adequate room must be provided for their growth. For more in depth information on caring for Gigas Clams see, Caring For Tridacnid Clams. Water Changes: Bi-weekly - To keep water stable, test weekly. Alkalinity Levels: 8.0 - 12.0 dKH - Best at 9 dKH. Magnesium Levels: 1,250.0 - 1,350.0 ppm - Adjust magnesium levels before checking calcium levels. Giant Clams can be kept in a reef environment with live rock. Place them on the substrate in the bottom of the tank. Keep fluctuations in water parameters to a minimum and water flow low to moderate. These are the fastest growing of the Tridacna Clams, and will grow very rapidly when provided adequate light and calcium levels. A high pH and high temperatures can cause problems. The size of the tank should be at least 100 gallons per 12 to 18" of clam. A full grown adult will eventually need 300 gallons (though larger is better) as this will help keep water parameters stable. Live rock is necessary and sand is preferred if they will be on the substrate. A mature tank is also important. The tank should be at least 6 months old from the time of adding that last piece of live rock. Once you see Coralline algae growing (that cool pink and purple hard algae) you know your tank is doing well and ready for your clam. Where ever they are placed, make sure the eventual 4 feet of room they will occupy is free of shadowing. Coming from shallower waters in the wild, giant clams typically need intense lighting. In the aquarium, Gigas Clams will do well under moderate to relatively high lighting intensities. They don't particularly like intense lighting nor will they tolerate sudden increases in intensity. Kelvin's that they do best at are 6K to 10K. Since they are typically on the bottom of the tank in the substrate, provide very strong lighting, such as 400W metal halides or intense LED lighting. However, take great care if attempting to acclimate them to intense lighting such as metal halides. Gigas Clams can be adapted to metal halide lighting, but this should be done over time as a gradual process. Salinity is critical, aim for a specific gravity of 1.024 to prevent swinging out of the 1.023 and 1.025 range. Automatic fresh water top offs are highly suggested to keep salinity stable. Low to moderate flow is best and turbulent as opposed to laminar. Choose an area of the tank where the water has a "dead spot" and that will please them. Keep pH at 8.1 to 8.3, do not let the aquarium exceed a pH above 8.4. For hardness, maintain a dKH of 7.9-12, with the optimal being 9. A temperature between 74 to 86°F (23 to 30°C) is fine, however keeping it closer to 83°F is suggested, and be sure to keep it stable. For more in depth information on caring for Giant Clams see, Caring For Tridacnid Clams. Minimum Tank Size: 300 gal (1,136 L) - Provide at least 100 gallons per 12 to 18" of clam, 300 gallons for an adult. Tank should be at least 6 months old, preferably with coralline algae growth. Lighting Needs: High - Strong lighting - Giant Clams will do well under moderate to relatively strong lighting, Kelvin's of 6K to 10K, to keep their coloring. Temperature: 74.0 to 83.0° F (23.3 to 28.3° C) - 83°F is suggested, but do not let the aquarium exceed 84° F. Keep temperature stable. Specific gravity: 1.023-1.025 SG - Stay within this range, aiming for 1.024. Too high or low a salinity can cause the death of a clam. Water Movement: Moderate - Not linear, low to moderate currents will be tolerated. All the Tridacna clams are very stationary and peaceful, and they are not aggressive towards other aquarium inhabitants. As the Giant Clam grows, it will lose its byssus gland. This is what other Tridacna clams rely on to anchor themselves in place, but the Giant Clam grows so large and heavy, it simply stays where is is put. They have the ability to close their shell as juveniles, but not as large adults. During all stages of growth they will need protection from anemones and some corals. They should not be kept near any stinging cell creatures and must be kept away from any sweeper tentacles. Anemones need to be watched, as they can move close to a clam and sting or eat it. Giant Clams commonly have small shrimp and crabs that live in the mantle cavity. They are considered ectoparasites or commensals, and they will not harm a healthy clam. Be cautious with tank inhabitants that may pick at the clam or eat its mantle such as Trigger Fish and Puffers. Blennies, Butterfly Fish, and Clown Gobies. Angelfish and some shrimp may also disturb Tridacna clams. Anemones: Monitor - Protect the clam from anemones that wander. Mushroom Anemones - Corallimorphs: Monitor - Safe as long as they do not come in contact with the clam. Leather Corals: Monitor - Should be okay if spaced apart. Zoanthids - Button Polyps, Sea Mats: Monitor - Should be okay if spaced apart. Shrimps, Crabs, Snails: Monitor - Small commensal shrimp are fine if the clam is healthy. Remove any small, rice-sized snails found on the clam's surface with a toothbrush. Starfish: Monitor - Starfish usually only eat dying organisms. Crabs: Monitor - Tiny commensal crabs are okay on a healthy clam, avoid other crabs. Snails: Safe - Make sure nassarius snails cannot turn a young clam over. Remove parasitic pyramidellid snails, other snails are safe. Sea Apples, Cucumbers: Threat - The clam will die if these species expel their toxins. Giant clams are much more sensitive to these toxins than other invertebrates, even if the system is large. Urchins, Sand Dollars: Monitor - Should be safe, but it is unknown if any or all species are safe. Stony Corals: May be aggressive - Only safe as long as they do not come in contact. Stony corals can sting your clam. Soft Corals: May be aggressive - Give clam plenty of space. The giant clams are protandry, meaning they are born male and change to female. Clams will release eggs and sperm that can number into the tens of thousands of eggs. This event tends to happen around sunset. One aquarist noted a spawning clam pulsing out eggs every two minutes. Once the eggs are externally fertilized, the embryos develop into trocophore larva, which are free-swimming. The next stage is the bivalve veliger, which sort of looks like a tiny free swimming clam. Once they are 4 to 20 mm long, they will find a shallow area of the reef to settle into, often perching on top or on the side of coral outcrops. Gigas Clams have been propagated in captivity, and the demand from aquarists has raised interest in producing colorful varieties of all the species. Gigas Clams have been cross bred with other clams to pull out more colorful specimens. Typically, there is some sort of outside stimuli that causes spawning, which can be a change in temperature, salinity, or other parameter. However this should be left to the experts, as clams spawning in a small system can cause serious pollution issues. 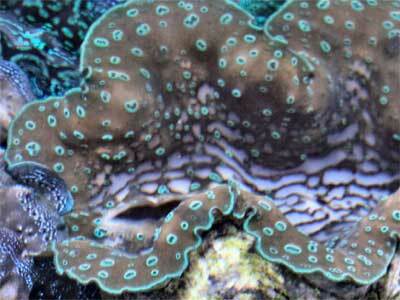 For detailed information of tridacnid propagation, see Giant Clam Breeding and Reproduction. Keep a watch out for predators! The Giant Clams can be easy prey with their large and wide byssal gland opening. The most dangerous predators are the highly prolific pyramidellid snails of the Tathrella, Pyrgiscus, and Turbonilla genera. These are parasitic snails about the size of a grain of rice or smaller, rarely reaching a maximum size of about 7mm in length. These snails attack tridacnids with a trunk-like snout called a "proboscis." They punch holes into the clam's soft tissue and then feed on its bodily fluids. While in nature, giant clams can deal with a few of these parasitic snails, in captivity these snails tend to multiply to dangerous numbers. They may hide in the scutes of the clam or in the substrate by day, but will often will be found around the edges of the clam's mantle tissue or byssal gape (large foot hole) after the lights go out. They can produce numerous small, gelatinous, egg masses on the clam's shell. These masses are transparent, so difficult to spot. Before putting it in the tank, scrub your clam's shell vigorously with a toothbrush, or other brush with firm bristles, to remove the snails and their eggs. Be careful not to scrub the clam's soft tissues, as that can cause injury and lead to infection. Inspect your clam regularly for several months and remove any snails you discover. Pinched Mantle: Another common affliction of giant clams is called the Pinched Mantle disease. The edges of the mantle become pinched and contorted, and the margins won't extend fully. This condition almost always results in death unless treated, and it can spread to other clams. The actual cause of this ailment is unknown, but it may possibly be an attack by some sort of protozoan. An easy treatment, that is is stressful but effective, is to submerse the clam in a freshwater dip for a few minutes. Signs of recovery can take a day or two. Bubble Mantle: Caused by laminar flow directed at the clam or pouring water directly into the aquarium in a way that causes bubbles to form (use a siphon and water pump and/or pour very slowly and carefully or pour into sump only). These bubbles can get stuck in the clam's mantle with can cause illness and death. Gaping: The larger of the two holes is gaping open, larger than normal. This is usually due to poor water quality. Stability of your water parameters need to be checked quickly and addressed. Giant clams are also quite sensitive to chemicals or toxic substances dissolved in the water, so be sure to maintain good water quality. As mentioned under aquarium care and aquarium parameters above, high pH, high salinity, and high temperatures can also cause problems. Avoid large weekly doses of anything, especially iodine, which has been known to kill them. For in-depth information on potential Tridacna clam problems, see: Tridacnid Clams: Friends, Enemies & Ailments. Gigas Clams obtained from aquaculture systems are occasionally available online, and it may be possible to special order them in stores.They are expensive to very expensive, depending on size and color. Because of its use as a food item, the Giant Clam has been propagated for commercial uses for many years. Specimens have also been introduced to the market for hobbyists. All specimens sold in the aquarium trade are aquacultured. Yes they can but will need a very large tank for a permenant home! Yes but it has to be big. Clams move with their foot. Their foot has to be muscular to help them move a good bit of a distance. Sometimes they can move an extreme distance if the current is strong. The currents can also help clams move. The clam sorta burrows its 'foot' (body) out of the shell and into the sandy bottom and pushes itself in a forward motion. It uses the current in waters to carry it along.